The New Athena System 96 Processor For Positive Pressure SPE Offers State-of-the-art Operation For SPE In 96-well Plate Formats. Positive Pressure Processing Of SPE Plates Has Numerous Advantages Compared To Traditional Vacuum Manifold Processing. Better Reproducibility Highly Uniform Flow Column-to-column More Convenient No Caps Or Plugs Required For Open Column Ports Easier To Use Higher Pressure Differential For Viscous Samples Reduced Carry-over Pressure-sealed Column Processing More Powerful Built-in Nitrogen Or Air Drying Of Extracts 96-well SPE Plates SPE ware Offers A Complete Line Of Spe Plates Optimally Designed For Use With The System 96 Processor. Based On Patented Manufacturing Technology And Using Advanced Microparticulate Sorbents, Athena SPE Plates Offer Much Higher Performance Than Conventional SPE Sorbents, With Greater Relative Capacities And Reduced Elution Volumes. Dual setting allow users to set different pressure for extraction and column drying. Includes waste reservoir with stopcock assembly to allow for direct drainage of waste. Single switch raises and lowers the sample racks and creates an airtight seal. Increased flexibility in method optimization. More reproducible methods with reduced risk of errors. 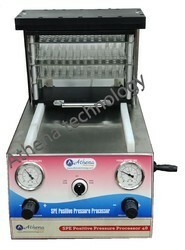 Positive Pressure Manifolds for simple Sample Preparation96 Positive Pressure Manifolds Athena System 96 for Positive Pressure SPE provides uniformity of flow - something that is not achievable with conventional vacuum manifolds. The System 96 offers an efficient solution to viscous samples. Vacuum manifolds often cannot provide adequate processing power, since the maximum pressure is limited to less than atmospheric pressure (approx. 15 psi). 96 well plates, 1 mL 3 mL and 6 mL column formats. The systems utilize a consistent, uniform flow of positive pressure to move both low and high viscosity liquids through SPE plates and columns. 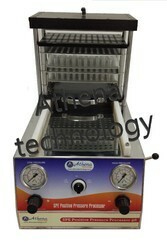 The Athena System 96 allows for gas pressures up to the supplied line pressure (typically 60-75 psi. 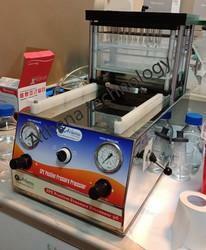 ), thus supplying greater motive force for viscous sample flow. Adjusting the pressure up or down, produces a column flow response that is smooth and immediate. The optional heated manifold provides for rapid and thorough column drying, resulting in cleaner extracts and superior specificity when working with non-polar elution solvents. In contrast, the System 96 uses unique, restricted-flow gas ports. These ports create superior flow control such that even if 95 out of 96 wells are empty, dry, or wet, the remaining single well will receive normal pressure to allow facile processing. The Athena System 96 allows for gas pressures up to the supplied line pressure (typically 60-75 psi. ), thus supplying greater motive force for viscous sample flow. Adjusting the pressure up or down, produces a column flow response that is smooth and immediate. The optional heated manifold provides for rapid and thorough column drying, resulting in cleaner extracts and superior specificity when working with non-polar elution solvents. By using stackable collection racks and extraction racks on the Athena PRESSURE 48 96 manifold, many combinations are possible to accommodate varying methodologies. Racks only fit the system in one direction, ensuring consistent processing throughout. 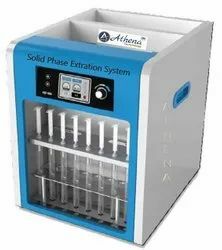 Automated Solid Phase Extractor, Athena Fat Analyzer is based on the Soxhlet Extraction Principle and Integrates such functions as soaking, extraction, leaching, heating condensation and Solvent recovery. Integral Dry Heating, wide scope and high precision of temperature control. Over-temperature alarm and timer reminding functions. Abundant interface contents give simultaneous Display of set temperature, actual temperature, Set Time Heating Time. Unique air insulation for temperature Heating protection and constant temperature. Automated Extraction System uses Solid Phase Extraction technology replacing the old, labor-intensive liquid-liquid extraction technique. The procedure reduces up to 90 percent of solvent consumption when compared with the conventional methods, exhibiting a significant reduction in purchase and disposal costs of chlorinated solvents such as methylene chloride. 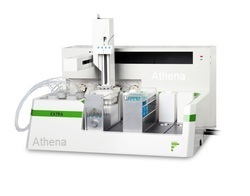 Athena Technology Tailored to the requirement of modern laboratory, EXTRA automated solid phase extraction system is specially designed to handle small volume samples for high throughput. After simple settings, EXTRA will finish all the solid phase extraction process to reduce the harm to operators brought by the solvents. The applications involve pesticide residues, veterinary residues, food additives, drug abuse and forensic medicine. Large space design accommodates up to 5 racks and 108 samples a batch. Four individual channels can handle four samples simultaneously to improve efficiency greatly. The spool of the multi position valve is made of ceramic, preventing liquid leakage and corrosion. Accessing up to 8 solvents at one time offers more choice and more convenience. Liquid level tracking system allows the probe fall following the liquid level. The waste can be collected separately by a waste segregated collection system. Automatically switch the pressurized gas to dry SPE cartridge and tubes. Collect up to 9 fractions to meet the requirements of operators. The probe wash station combines rinsing of outer wall and inner wall. Numerical control SPE supports the every step of wholes experiment of solid phrase extraction. It adopts digital control pump to offer constant positive/negative pressure to each SPE column. Every liquid will be injected into column on the certain flow rate which is according to the standard analytical program. Target analyte will be efficiently extracted and the column will be transfered to the elution rack, uniformly eluted on positive pressure, which can avoid cross pollution. ² The flow rate of single track is 0.01-7ml/min. It supports large volume injection and positive-pressure elution which can avoid cross pollution. ² LED digital display can shows the actual speed with timer. ² The column connectors have good resistance of acid, alkali, organic solvent, oxidizing agent. ² Maximum 8 samples can be processed synchronously which enhance the working efficiency. ² With good consistency, easy to control and adjust. ² With good leakproofness and stability, rotate speed and flow speed present good linear relationship. SPE Vacuum Manifold System Vacuum SPE Manifold, Solid phase extraction SPE is a chromatographic technique used to prepare samples for subsequent analysis by removing interfering substances that may be present. The general procedure includes sorbent activation, loading, washing and eluting. This is done either by retaining the substance of interest and washing off everything else or by retaining the interfering substances and eluting the product of interest. The vacuum SPE devices are designed to concentrate or isolate analytes from complex sample matrices. It allows processing of extraction columns with high sample throughput at minimal expense. Solvents and samples are aspirated through the columns by a vacuum of 0-20 inches Hg. 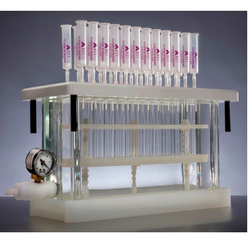 Eluates are collected in tubes positioned in a removable rack inside the manifold. The 12-ports and 24-ports manifold accommodate up to 12 and 24 columns, respectively. Multiple sample processing saves time and money. Female Luer inlets fit all male Luer tipped SPE tubes and cartridges. Compatible with standard Luer-tipped SPE and filtration columns. Glass chamber allows easy visual monitoring. 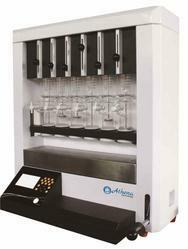 Adjustable racks accommodate a variety of test tubes, vials and flasks. Looking for SPE Positive Pressure Manifold ?